One huge list of plugins and mods that shows compatibility from 1.8.x -1.14! This new page will provide you with all the details you need to pick the right plugin for your server. There are some basic assumptions I would expect you to know & understand. You follow the plugin owners policy for reporting issues. Read the Overview Tab carefully, or you may not get the answers you seek in a timely manner. Your first response is NOT to report a bug, but to investigate what you did to cause the bug to be seen. You report ALL FACTS related to your server setup to help the developer identify where the problem is. If you don't provide the server type (Spigot, Paper Spigot, Bungee, Forge, etc.) along with its version and the version of the plugin(s) you are using, you may not get the answers you seek. Do not assume the developer or anyone helping you understands or has knowledge about your server setup. Only you have that information so withholding it only hurts your chances of getting help. Finally, read this again and pay attention to the Overview Tab for each plugin and what the policy is for reporting issues and getting the support you need. This page provides Server Owners, Developers, Administrators, Moderators and others), with THE MOST DEFINITIVE list of all the known plugins that are supported or not supported from Minecraft 1.8 through the (now) current Minecraft 1.13.2 Servers in a very simple spreadsheet to help you find what it is you need. You will not find any other resource with all the details in one document regardless of what type of server you are running. Column A (hover over with mouse pointer), provides a summary of what the plugin does. This information in most cases came from the plugin owners page. The Premium column shows which resources you need to pay-to-download and usually comes with many support options. Columns 1.14.x, 1.13.x, 1.12.x, 1.11.x, 1.10.x, 1.9.x and 1.8.x show the latest version the plugin is supported or has been tested by the community for each Minecraft Release. It is up to YOU, to visit their site periodically for any updated versions you should download. There are also columns for Java 7 thru 11 as well as a new OpenJDK Column which will become more of a standard in 2019. For those plugins who have upgraded to support the latest and greatest of Java, they should provide these details on the Overview tab. The entire spreadsheet is open for sorting any way you prefer. Just click on the icon shown below to open the properties panel for that column. 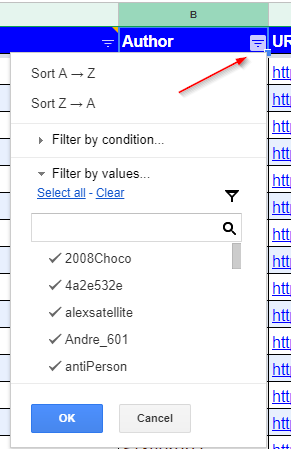 You can sort from A to Z or Z to A, Filter by condition, Filter by values and search for a value in the column of your choosing. Alternatively, you can click on Data menu option and choose one of the Filter views. These views automatically sort/filter the results for you with a simple click of a mouse. All resources now have a "Category" column and a Category tab (at the bottom). I've reviewed all of the resources to allow users to narrow down on exactly what type of resource they are looking for. I understand that some may fall under multiple categories, but for now there is only one. If you notice any that may be better suited for a different category, drop me a note on Discord or you can reach out to @Shano_dekono who's been tremendous in helping me with a lot of the updates and new additions! Everyone has READ ONLY access to this spreadsheet. As we are made aware of new plugins or existing ones being added or supported in the latest release by multiple sites, we will add similar data to the spreadsheet. If anyone has recommendations for what they find hard to find about a plugin which is not provided here, do send send us a Private Message (PM) via Spigot and we will consider adding it to the spreadsheet. You can also reach me on my Discord Page https://discord.gg/Gn6YW6a. NOTE: If the resource Overview tab does not have enough details that can be added to the spreadsheet for others to understand what it is,what versions it supports, or adequately provides details that everyone can understand, then it will NOT BE added until it does. This spreadsheet (link below) is the only official document where we will spend time on as it provides greater value than the individual Spigot Compatible Plugin pages we did in earlier releases (top of page). There are just too many to try to keep those pages updated when active development work is in-play constantly. All these updates do take time, just like developing the plugin itself. This document is designed to grow as the product offerings grow. Should you appreciate the hours each day and effort we put into monitoring over 1,000 resource updates daily. Send me a donation via PayPal or Patreon Your donations are very much appreciated! Many, many thanks should go out to @Shano_dekono who has also tested many of the resources and provided countless new ones to the spreadsheet! It's friends like Shano who help make this possible! Minecraft 1.8.x all the way thru to 1.13.x. Resources are now split out onto their own spreadsheet based on the type it belongs to (Spigot, Bungee, Paper, Bukkit, Sponge, Forge, etc.). Just click on one of the tabs at the bottom of the sheet. Resource Categories - you can now sort out resources by a more realistic category like Crafting, Tools, Building, Food, etc. Java Version Quick Link - Each of the Java columns has a quick link back to Oracle to download that version of the JVM. All of these entries takes many hours of research, editing and testing of new plugins being offered in the later versions. Getting developers to reach out to us to add more plugins helps everyone involved. Let us know what you think and if you have other suggestions or additions to make this easier.